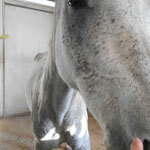 Training Unknown. 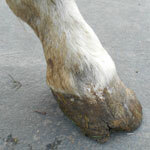 At least halterbroke. 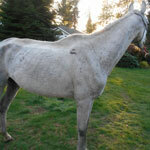 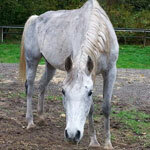 Huntress is an approximately 7-9 year old flea bitten gray Arabian mare. 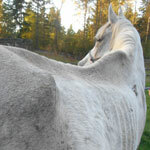 She is purebred, but at this time does not have her papers or bloodlines. 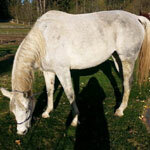 She stands about 15hh and has a very typey build. 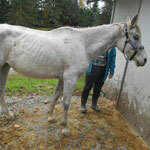 Huntress is currently in need of rehabilitation. 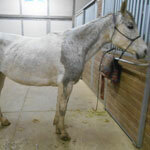 She is severely underweight by about 300 lbs, which makes her a 1.5 or so on the Henneke scale. 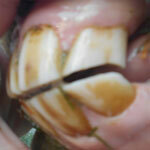 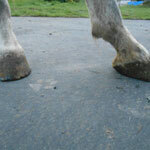 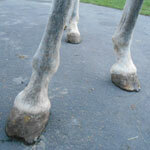 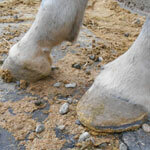 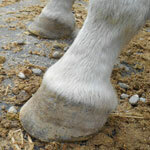 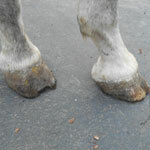 Her feet are atrocious, she has rain rot covering her back and a little bit of mud fever on her heels. 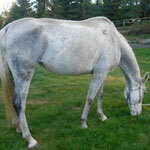 In addition to that her belly is very bloated, so she likely either has a high parasite load or else is pregnant; perhaps both. 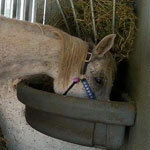 Huntress is friendly and fairly well mannered, although she could use a bit of a refresher course because she tends to try and grab food wherever she can instead of focusing solely on her handler - which I guess is perfectly understandable given her situation. 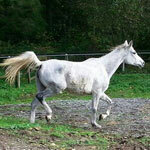 She leads nicely, ties nicely, stands politely and picks up all her feet easily. 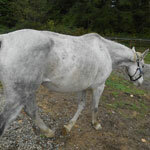 She does not try to rush through door ways and is careful not to bite when taking a treat. 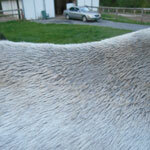 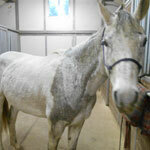 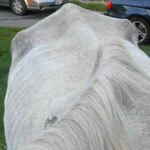 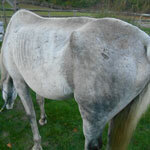 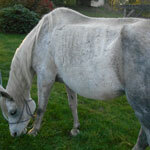 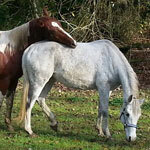 She loves other horses and stresses when she cannot be with them, but she is submissive in a herd and sometimes other horses beat up on her, as is shown by the many bite wounds that currently decorate her hide. 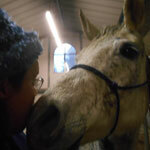 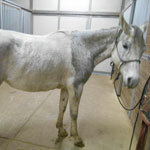 It is assumed that she is not broke to ride, but once her rehabilitation is completed, we will test that theory. 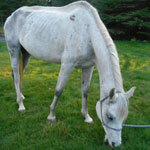 If she is not broke then she will be sent for training in the spring. 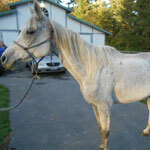 Right now the plan is to get her set up and geared towards being a western trail horse. 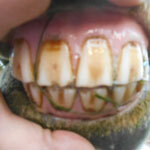 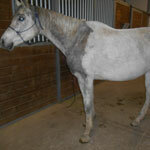 When she is healthy and trained, she will be offered up for adoption under contract. 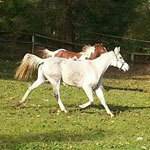 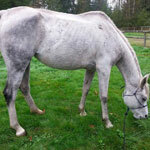 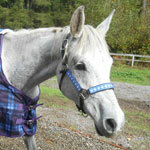 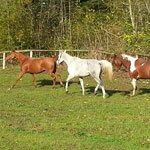 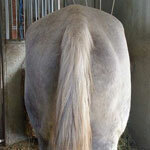 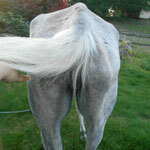 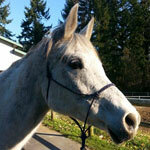 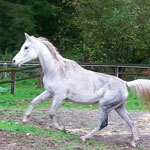 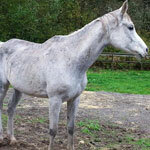 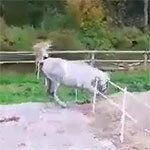 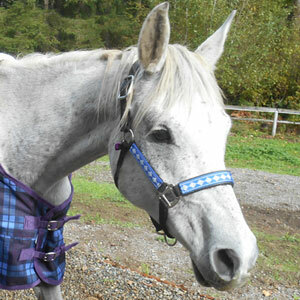 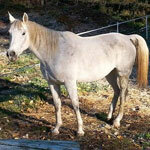 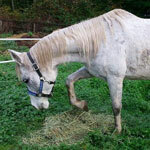 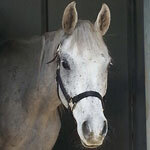 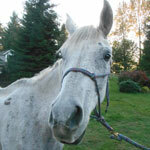 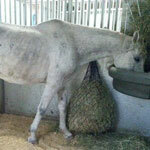 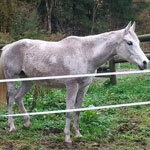 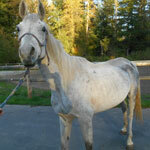 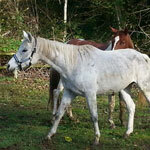 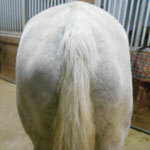 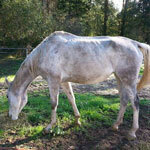 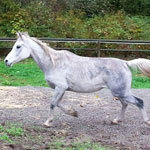 Huntress is a young Arabian mare who has had quite the run of bad luck in her short life. 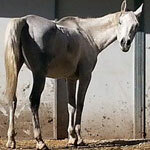 This fancy little filly, along with three other fancy Arabs, were seized for overdue board fees and were sold without their papers or identities at a cattle sale. 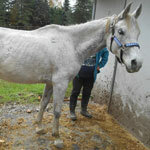 She and her companions were purchased by a kill buyer and taken to a feedlot to await transport to slaughter. 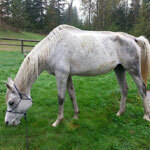 Luckily for her she was pulled from the feedlot by the combined efforts of concerned people on the internet and given to a home. 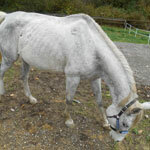 Unfortunately her time on the feedlot was not so quickly put behind her as she and another horse who came with her contracted Strangles. 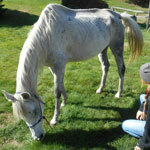 Six months later she was 300 lbs underweight with her new home unable to get her back up to health. 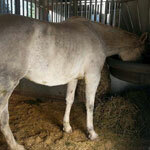 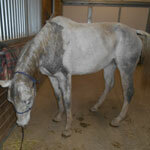 After a visit from Animal Control, she and several other horses were put up on CraigsList for free. 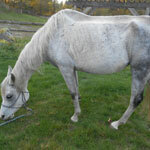 When I became aware of her and saw that no one else seemed interested in an unhealthy and untrained Arab, I offered to take her in.